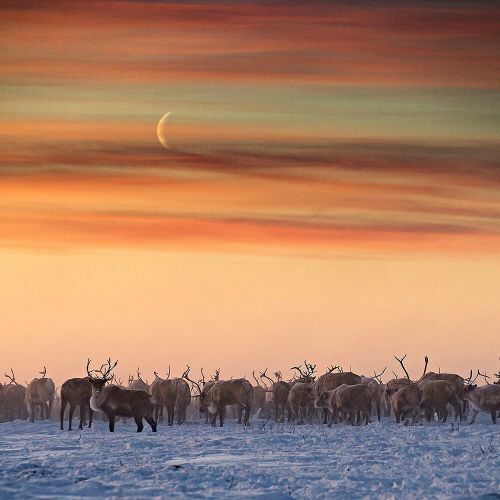 "A crescent moon above the Canadian Reindeer company's open-range herd. The #reindeer, which were photographed by @csmphotos, graze on land between Inuvik and Tuktoyaktuk, 2 small communities in the Northwest Territories, a vast expanse almost 3 times the size of California. Next year, a new road will link Inuvik to Tuktoyaktuk, which sits on the Arctic Ocean. When it's complete, the road will be the only public highway to the ocean's shores, fulfilling a decades-old dream to link all 3 Canadian coasts — the Atlantic, Pacific and Arctic. In the words of @nytimestravel writer @peterkujawinski, a road trip from the United States to Tuk would be "epic." This #nytweekender, we have been sharing @csmphotos's pictures from a #roadtrip to the end of the world. Visit the link in our profile to read the full @nytimestravel story." By nytimes on Instagram.